Photograph This! : Background Test for Apnea style photo. She is the lovely Apnea. The photo was taken by the awesome Lithium Picnic. I am not sure about the subject on the right, but that is beside the point. The lighting is subtle, if simple, so how did he do it? My light set up is above...it is a quick first attempt. The interesting bits are the background color gradient and where the lights were. I suspect a bit of photoshopping to brighten up the subject. There is definitely a large softbox as fill (it shines on the rubber at camera left). The light set up I used is below. ISO 100 f9.0 1/160 18mm. Subject at 2ft from background 800ws Octabox and Softbox at 1/32. Diffused 400ws strobe at 1/8th. Lights 6ft high. (the diffused strobe might not be necessary..). The color gradient was achieved with two layers and the "curves" command. The reddish one was erased on the right. I roughly matched the background colors from the original. The man skin is obviously darker than hers. Things that did not work out: there are two shadows on the right! and not enough detail in the darks. (note: her right background reads 82 87 90). What to do? Move octabox to center and closer to subject. Add a tad more fill, but not on background. 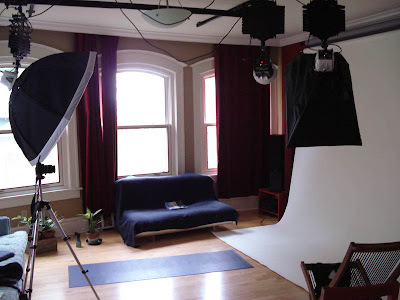 Lower both softboxes one foot. Move strobe a little further away? Right softbox at same distance as subject. subject a bit further from background. I'm flattered you would want to recreate the lighting. You did a good job. That was shot many years ago if I remember correctly I just used one medium small softbox at a 45 degree angle like you have the one in the diagram... general location is correct but it was angled down from higher up like the umbrella box next to your tripod... at appx a 45 degree angle down - good old Rembrandt lighting. I usually had a 5 foot rectangle or oblong silver reflector on the dark side of the subject kicking in a little fill from a 45 on the left... you can get away with a lot less power and light with the white paper everywhere - it kicks a lot of light back up and around... Your version looks nice - I do notice that the trailing shadow behind the left leg seems a bit harder which I don't find worse or better - it's just different.